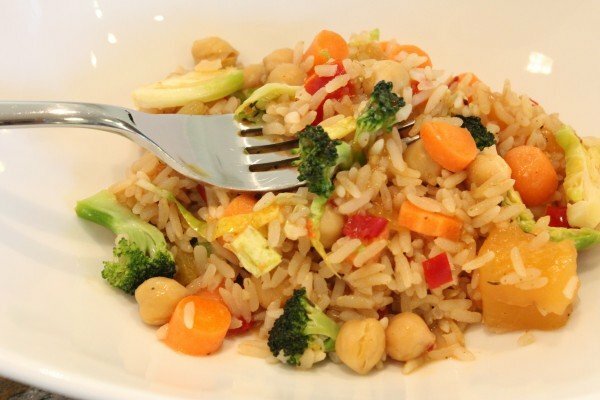 Need a one-pot meal that comes together in under 15 minutes, will feed your family, makes planned leftovers, costs pennies per serving, and happens to be vegan and GF? This recipe should do the trick. Rice is about 90% done. Then, add everything else. 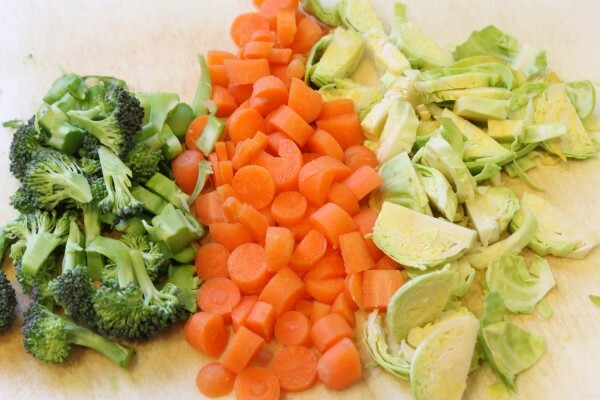 The veggies were not overcooked and had a bit of texture and crunch. I detest over-cooked vegetables. Blech! The flavor was wonderful. A little bit of heat from the red pepper in the mango salsa, the balsamic gave it some tang and balanced the sweetness from the mango and honey. 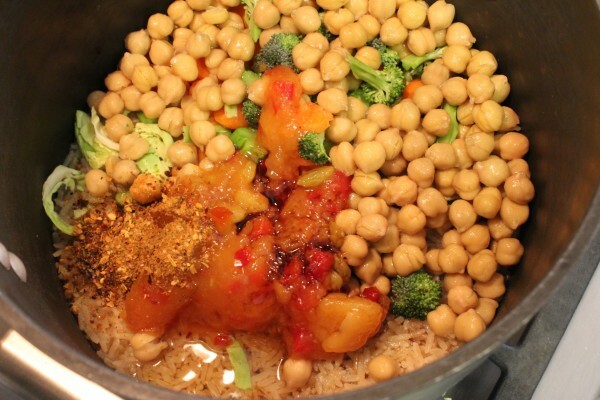 And the chickpeas added protein and made it a one-pot success. And it was also successful because it made planned leftovers. Love your leftovers. I do. Like today’s recipe? 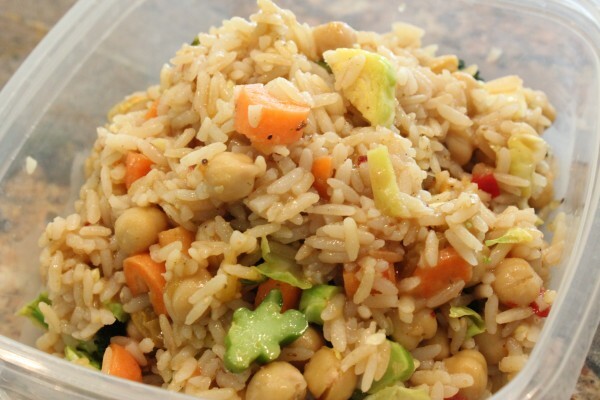 Also try my Caribbean Coconut Rice with Garbanzos, Veggies, and Peanut Butter. It works, I promise. 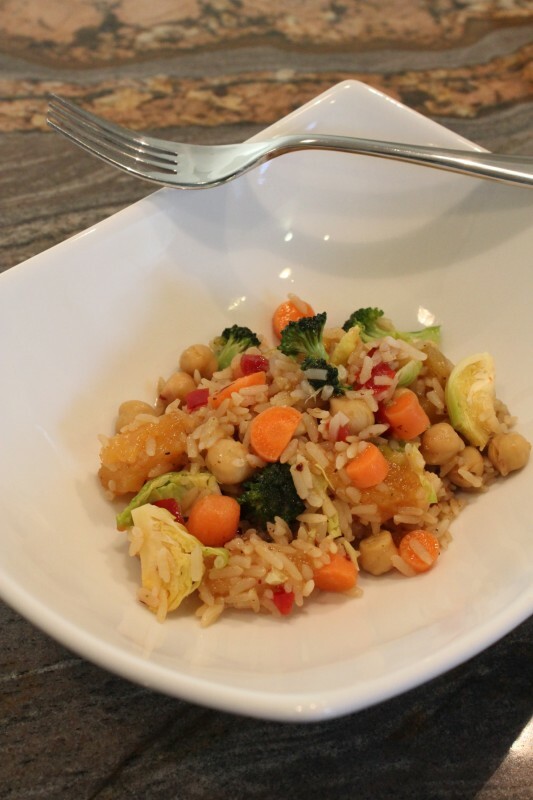 Need other One Pot Meal Ideas & Recipes? Like Gluten Free Mac n Cheeze? I’m glad you like my last post about bodysprays! Seems like lots of you are fans and thanks for filling me in on your go-to scents. And everyone had different days of the week that they are busiest. Mondays are my busy day, for sure! Here’s a one pot snack. Or a one little bowl snack. 1. What’s your fave one-pot meal? 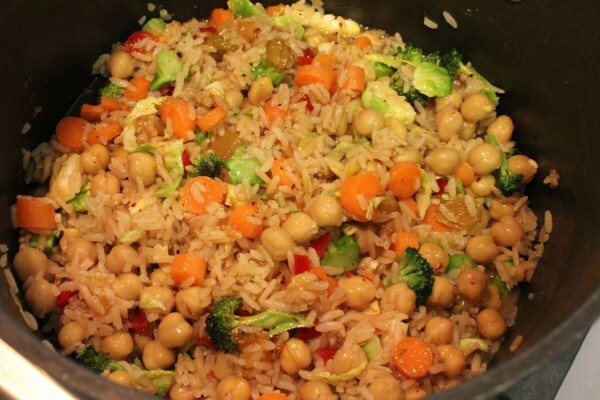 Mine are any of the bakes (Salsa Baked Beans & Veggies, Cheezy Veggie Bake) or rice dishes like this one. And I never buy ingredients just for a recipe like this. It’s called shopping in my own kitchen and use things up that are taking up space or getting old. 2. Do you like leftovers? I know some people hate them and would prefer to eat something “new” every meal but leftovers are a huge time saver and money saver, too. I am a fulltime working mom, a blogger, I try to keep my grocery budget at a minimum, and I try not to live in my kitchen just to feed my family. Therefore, leftovers are my best friend. For all you young beautiful people, if you don’t like leftovers now, you may change your tune when you have a family, kids, house, fulltime job, and want to “get off the hook” for meal prep. Leftovers will save you. 3. Anything exciting happen in your day today? I am expecting a package in the mail I am excited about. I am the self-professed QUEEN of leftovers. Sometimes, I cook such big batches of food on Sat/Sun, that I don’t need to do anything more than make a salad or steam veggies for 4 or 5 days. I have friends at work (mostly from China or India, where until just a decade or so ago, they didn’t have much refrigeration) who think that leftovers are evil and I’d be better off eating out. Not only am I doing the leftover thing, right now I’m attempting the $50/week grocery bill thing (not including the CSA, which is an extra $20). That rice dish is RIGHT up my alley. In fact tomorrow will be brown rice with stir-fried frozen veggies from Costco with extra cabbage, ginger, garlic, and soy-sesame-rice vinegar sauce. and so some weeks i can get away with $50! 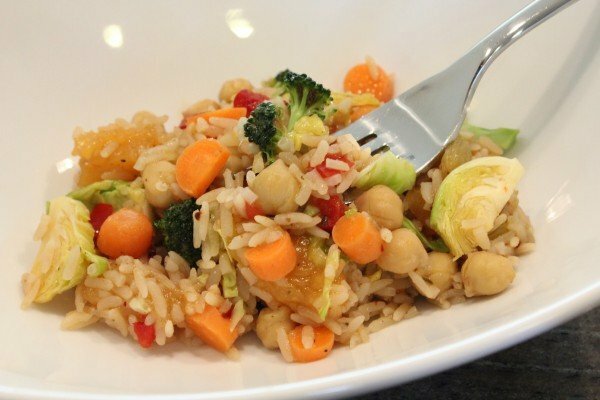 I love one pot meals, especially when they are healthy!!!! 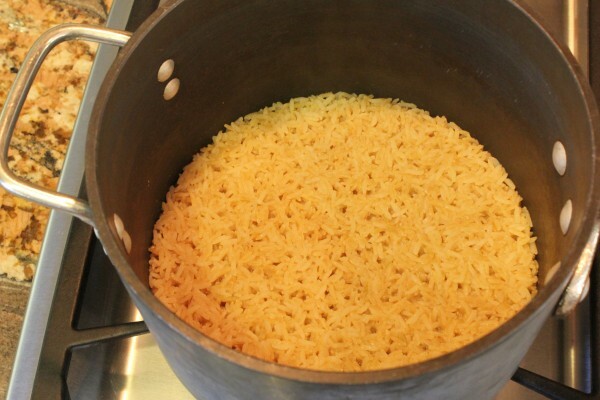 I loved the Caribbean rice and mac and cheese, so I am sure this new recipe is another keeper!!! 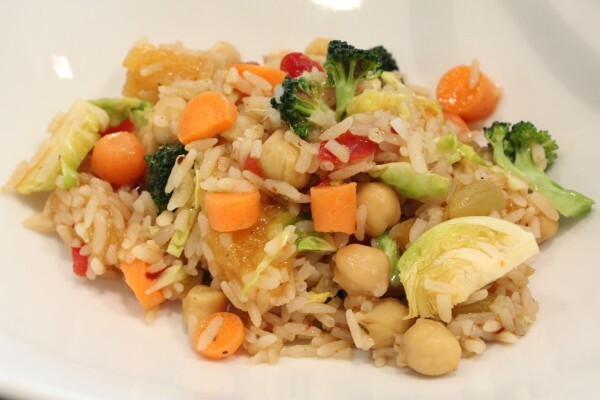 The rice looks delicious – it has all of my favorite veggies in it :) YUM! Chili has got to be my favourite one pot meal and I love leftovers! I plan for them with each dinner. 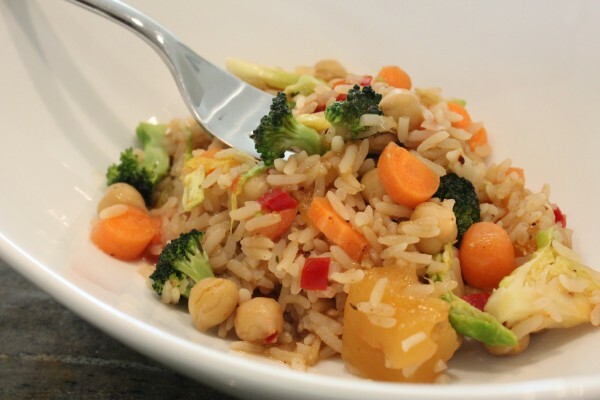 I love the recipe that you posted and think I’ll try it this weekend sometime with broc and asparagus…..
Averie, I made the mango rice tonight and it was great. I misread the amount on the mango chutney and added (maybe) more than needed but it still turned out great as I added more veggies than you suggested. I did leave out the honey/agave as it was already sweet from the chutney. We also had a big kale and veggie salad with your slaw dressing and to top off making it an “Averie cooks” meal we had the raw vegan PB vanilla balls (I just made them today and there are very few left – I was only able to get 16 out of your recipe). 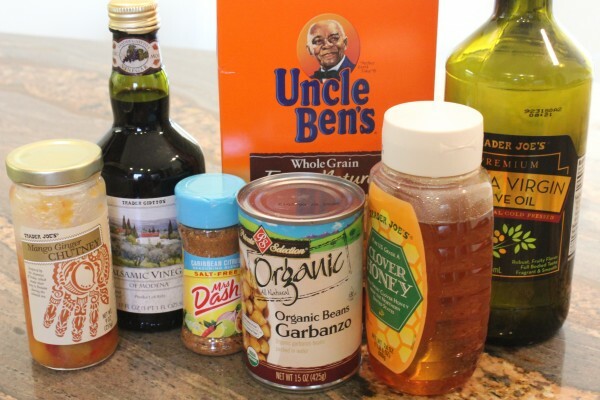 I am making the carribean rice dish tomorrow…looking forward to the coconut milk and PB flavors. I should also let you know my husband asked if there were any more of the raw vegan almond butter cookies left, luckily I threw a few in the freezer…I am impressed by how much he has enjoyed all your recipes. THANK YOU!! What a glowing comment! The mango rice, salad w/ slaw dressing, PB balls, AB cookies…wow, I am sooooo thrilled that you’ve made all these recipes of mine in what, a week? You rock! Thanks actually making things AND coming back to tell me about it. The feedback is worth it’s weight in gold! Since you seem to be on a no-bake ball kick, here’s a post with pics to all of them which may inspire you for more. Keep in touch and LMK what you make! Thanks for the link. I will look over it. I may end up making a few of the recipes and bring them for my family mother’s day get together!